In a world that is increasingly competitive for people's time, attention, and inbox space, professionalism is getting lost in the ruckus. Entrepreneurs are starting businesses right and left and either there is no time to learn professionalism in the race to the top, or they are so much rejecting the corporate life they left, that they mistakenly think professionalism is out of place in “their business”. Dave Ramsey said in a recent podcast that “there has never been an easier time in history to become a self-made millionaire.” However, the be-your-own-boss idea sweeping millennials off their feet is empowering to the point that many believe they can also do business as they wish, without bothering to learn (and practice) the classic rules of the game. You must understand that the age-old codes of professionalism are so classic that if you do not learn and apply them to your modern-day laptop-lifestyle business, you will never know the professional status that could otherwise be yours. The #1 Reason You are Still Not a Professional Blogger? One of those “old” codes being wildly violated by today's rising thought leaders and bloggers is the code of professional language and it is one that takes very little effort to change, and can push you ahead of the competition if you choose to use it! If you use slang and/or inappropriate language in your email subject lines or body text, it's time to spruce things up a bit. I daresay subscribers around the world have received multiple emails in the last week, probably even today, from “authorities in their field” whose subject lines started with an expletive, slang or other inappropriate inuendo. I understand the reason, professionals NEED to get their attention. Professionals NEED people to open those emails and to read what they have to say. But the end justifies the means, in this case, is not the wisest course of action. Unfortunately, even if subscribers DO read the email, their opinion of the person (or brand) is now tarnished because of poor choice of language. As a professional blogger, you must realize that your business reputation and your authority status are on the line EVERY time you put yourself out there publicly. Choose your words wisely. There are millions of bloggers every day working as hard as they can to build a reputation as a professional. Don't ruin it for yourself, (and the rest of us) with your poor choice of words. Would you be using that language if you were writing an email for your former corporate boss? I think not. If you left that job for a higher calling, you CAN hold yourself to a higher standard. Great rule of thumb: If it wouldn't fly in a corporate email, don't use it in yours. If you use slang and pompousness in your media appearances (and this includes Periscope), it's time to rehearse a different act. There are too many self-made experts today who unnecessarily brag about their success or sarcastically and unkindly address their critics. Too many “professional periscopers” who unnecessarily use slang or vulgarity, or abuse people's time to show off their silliness. Great rule of thumb: If a representative of (insert most prestigious brand you want to work with) were to see this, what would you say, how would you speak, how would you present this content? If your website, posts and emails are full of spelling and grammar mistakes, it's time to hire an editor. Yes. It happens to everyone, sometimes – spelling and grammar mistakes. I give you permission, for the sake of your professional blogging career and the future of your business, to hire an editor if this is a real problem for you. Nothing (except the previous 2 things) screams AMATEUR louder than spelling and grammar mistakes in the copy. This point is especially valid if your business is one of training or teaching. You sound like you know your stuff. Your website looks awesome, but you can't be taken seriously as a professional if you can't handle well the simplest details of reading and writing. And saying “I know my grammar isn't perfect, I just write like I talk.” makes you appear lazy, rather than professional. A great many sites of otherwise great teachers are being abandoned by their readers every day because of the mixed signals this sends, and it so easy to fix! Great rule of thumb: Read everything over at least 3 times, out loud. Use spellcheck, have a spouse, child, friend, VA or mastermind partner read through it before you publish, or hire a professional editor. And even then, there may be an occasional mistake that slips through. As a professional you should be concerned enough about your reputation for excellence to receive those notifications of errors with grace and to prioritize their correction. 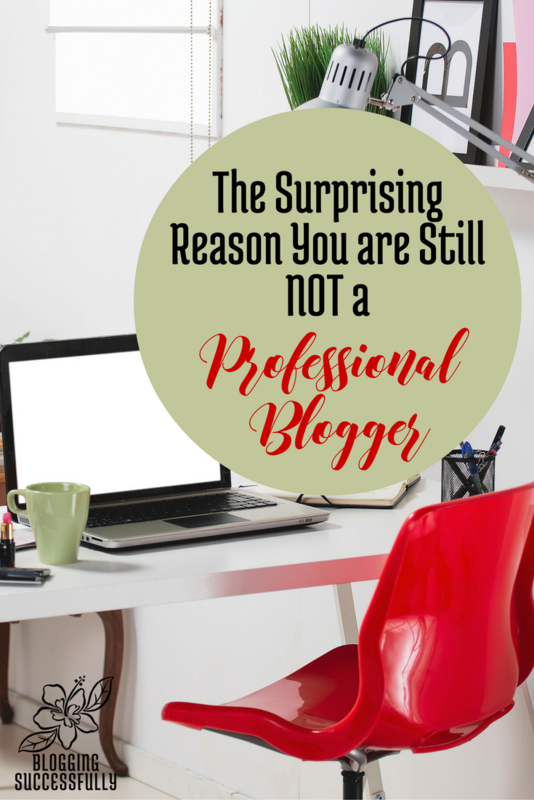 So, Are You a Professional Blogger? Remember the old saying: “It's not about you?” Put yourself in your ideal reader's shoes. Would you look up to you as a professional you would want to model yourself after and/or learn from? At the end of the day, even though your website, social media, and content may be stellar, your language choices may be the one thing holding you back from a successful career as a professional blogger, and it's something that is very easy to change. Make the intentional choice to be a professional even in your choice of language and you will go far. Have you signed up for our Como Blog Connection yet? We're turning hobby bloggers into professional business owners and we'd love to have you join us! Click here for more information! I TOTALLY agree with this. We need to quit wasting people’s valuable time with nonsense. Professionalism is important if you want to be taken seriously. I couldn’t agree more Dawnita. Thanks for your comment!